Running your own conference can seem like a daunting prospect, and one that only large businesses have the resources to do. From my experience, this just isn’t true. Even the smallest of companies, with limited marketing resources can (and should) seriously consider having an event, with informative talks for their customers. These can range from a morning or afternoon session with a dozen or so customers, to a full day event with 100 attendees and beyond. It depends on your customers and your resources. Whatever the size, I personally view them as a worthwhile investment. Benefits include; differentiation from your competitors, increased engagement with your base, content marketing opportunities, social sharing and positioning yourselves as thought leaders. 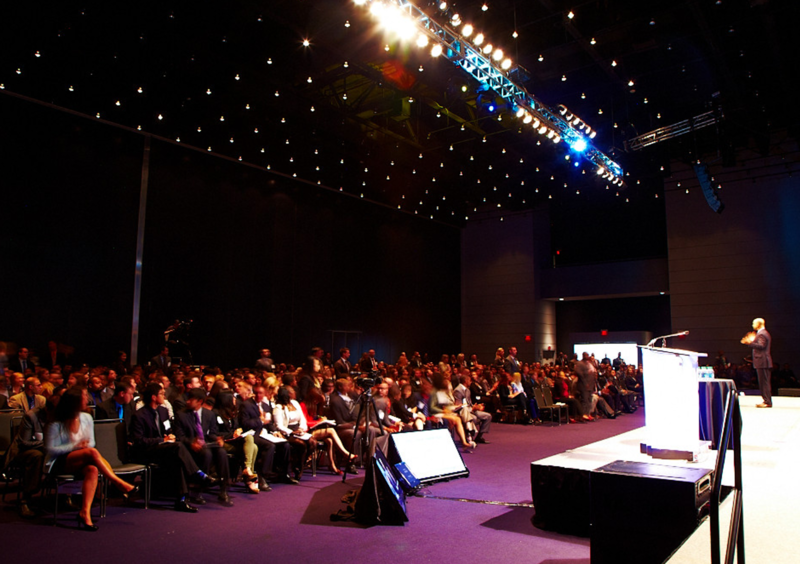 Here are my top nine tips for running a successful conference for your customers. What information can you give your customers that will help make them be more successful? Is you approach your conference with that always in the back of your mind, they will have a great day. No one will want to spend a day sitting through glorified product walk through/sales pitches. With so much to do, start your planning nice and early because time will fly. Before you know it, it will be the day of the event, and you’ll wonder where it all went. Planning far ahead reduces what is going to be a stressful experience any way. It means you have time to adapt to unforeseen humps, and get new plans in place. I would recommend creating a Gantt chart with all the tasks you need to complete in the build up to the big day along the X axis, and dates on the Y axis. By laying out the information this way, you can instantly see where you are overloaded a week, or underestimated resources. For an events like this to succeed the whole company needs to have bought in to the idea, and view it as everyone’s responsibility to make it a success. With hand out to design and buy, talks to write, slides to design, venues to book… planning a conference for your customers requires a lot of work, and you can’t do it all yourself. Maintain oversight to keep it all consistent and on time, but delegate areas of responsibility to other team members to help spread the load. The more they feel they own their area, the better job they will do. You will also need volunteers to help on the day. They will help with attendee sign in, covering questions and generally making sure the day goes smoothly. One of the biggest mistakes I made when organising an event, was not keeping everyone in the loop for areas they weren’t contributing to. I took the approach that as long as I knew it was in hand, that would be enough. The speakers and volunteers knew enough to do their job. But that meant only I had the complete picture, which caused some confusion about progress and responsibilities. In some cases it also led to de-motivation, because they didn’t feel they were part of the whole experience. I would recommend a kick off meeting to explain the objectives, the outline of the day and who will have responsibility for what. From there start with monthly meetings, with the meetings and catch-ups becoming more frequent as the day gets closer. You are asking people to take a day off from work, or even their own business, to come and join you for a full day. You have to make it clear what is in it for them, and why it is worth their time. In your email to the customer base announcing the day, and driving them to landing page to sign-up, make the benefits of them attending clear, and give an insight in to the areas you will cover. Getting your customers to buy more: How to implement timed and targeted upsell messages, increasing your average basket size. I have had the luxury of working for companies that have in-house development resources to build sign-up forms. If you don’t, there are two options you can choose. Add a simple contact form to your website that emails you the sign-up forms, and you manually add them to a database or spreadsheet. Use a purpose built tool like Get Invited that comes with everything you need to manage your attendees. This also helps to get fellow attendees interacting with each other on social media. The day itself is only the start. Record the talks and take plenty of pictures during the day to share after the event, encouraging people to share. Your website: Create a landing page with a summary of the day, and pictures and videos available to watch, download and share. Also make the slides available to download. YouTube: Upload all the talks from the day for people to discover and share. Slideshare: Put the slides on slideshare for people to discover and share. Instagram and/or Flickr: Upload pictures of the talks, people enjoying the day and any social event you have after the conference finishes. Twitter/Facebook: Thank everyone for coming and drive traffic to your videos and pictures from the day. Email/newsletter to all customers: Thank those who came, give a summary of the day and drive traffic to your videos and pictures from the day. I would send a survey the day after the event to everyone who attended, thanking them for coming along and asking them to rate various aspects of the conference. Which was their favourite talk? How did they rate the venue? How did they rate the refreshments? You can use this information to gauge success, and make changes to your next event. Your own conference is a great opportunity to present yourself as a reliable and trusted brand. You won’t pull this off by being tight with your budget. Hold the event at a quality venue, with good quality hand outs (booklet, note pad, pens…) with enough refreshments for everyone.